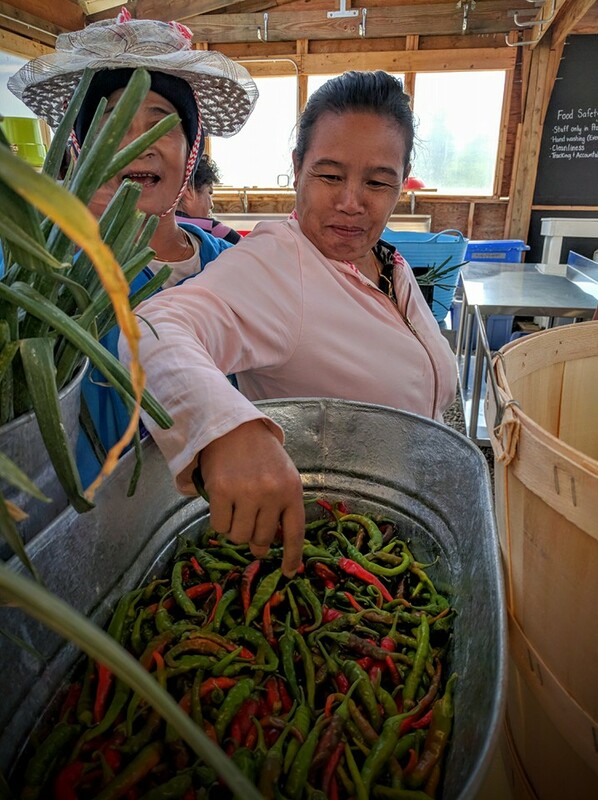 The Yu Meh Community Farmer Training Program is an intensive educational training program, designed for refugees, in the areas of sustainable farming and community food security. Project Worthmore (PWM) recruits Community Farmer Trainees. Community Farmer Trainees learn all aspects of sustainable community farming including best practices for organic agriculture and agroecological farming, CSA management, food safety, volunteer management, and leadership. The program combines hands-on work experience with more formal instru­­­ction. In addition to technical training and education, Community Farmer Trainees are provided with a monetary stipend and farm membership, which includes a weekly share of the fresh produce grown. Community Farmer Trainees may be chosen to continue the program as a Community Farmer, based on leaderships qualities cultivated and the desire to further the learning process. Community Farmers become valued and trusted members of our DeLaney team. Community Farmers continue to gain knowledge, experience, and are provided with leadership roles. They take on responsibilities and managerial tasks that require a higher skill level. We aspire to create partnerships with local businesses and organizations in order to aid Community Farmers in obtaining related jobs out in the broader community. The program offers refugees of all ages and backgrounds opportunities for job training, education, and community development skills. The program also offers refugees the opportunity for increased food security, a safe place to feel more connected to the community and the land, increased self-sufficiency, and an overall sense of well being. Each season, PWM identifies 15 individuals who wish to participate as a PWM Farm Member at DeLaney. Each Wednesday and Thursday during the harvest season (June-October), PWM Farm Members are provided transportation to the farm, receive hands-on education, and provide volunteer work on the farm in exchange for a weekly share of produce. PWM Farm Members experience weekly produce pick-up the same as public Community Farm Members. During pick-up, PWM Farm Members learn best uses for their produce and oftentimes gather afterwards for a community potluck. This opportunity is key to supporting self-confidence and self-sufficiency by allowing refugees to provide for their families while benefitting from the therapeutic aspects of farming and a safe community space. Community Farm Members and the neighbors of DeLaney are invited to join the PWM Farm Members each week, volunteering beside them and taking part in the potluck. Please visit Volunteering at DeLaney if you are interested. In order to reach the larger refugee community, farm shares are also dedicated each growing season to the Yu Meh Food Share Program located in the same building that houses PWM offices in the heart of Aurora’s refugee community. The Food Share Program is a community-centered, culturally relevant program of PWM that increases access to healthy, fresh produce for refugees in the Denver Metro area. This program is unique in that is it managed by a refugee woman from Burma and only distributes fruits and vegetables biweekly to over 150 refugee households. Please consider sponsoring a PWM Farm Member. Learn more about Yu Meh from the video below, created by our friends and partners at Project Worthmore.